Scientists at Rice University and colleagues at the Chinese Academy of Sciences, the University of Texas at San Antonio and the University of Houston have reported the development of a graphene-based robust, solid-state catalyst that shows promise to replace expensive platinum for hydrogen generation. The researchers have shown that graphene, doped with nitrogen and augmented with cobalt atoms, is an effective and durable catalyst for the production of hydrogen from water. 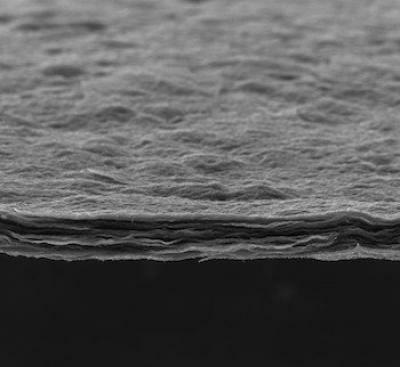 This could be used in fuel cells, among other applications. The scientists state that this work is unique in that it makes use of atoms rather than metal particles (or even metal nanoparticles) and thus it is as small as can be. Also, they add that in this process, the atoms driving catalysis have no metal atoms next to them so it is done with very little cobalt to make a catalyst that nearly matches the best platinum catalysts. In comparison tests, the new material nearly matched platinum's efficiency to begin reacting at a low onset voltage, the amount of electricity it needs to begin separating water into hydrogen and oxygen. The new catalyst is mixed as a solution and can be reduced to a paper-like material or used as a surface coating. While single-atom catalysts have been realized in liquids, they were rarely achieved on a surface. This is an advantage as this structure can enable building electrodes out of it, which should be easily integrated into devices. While platinum-carbon catalysts still boast the lowest onset voltage, these graphene-based ones are very close to it, much easier to produce and hundreds of times less expensive.